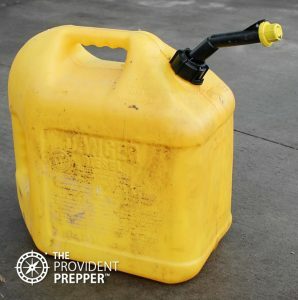 No one will argue that fuel is absolutely critical for survival and must be factored into your emergency preparedness plan. There are a wide variety of fuels and it is difficult to decide which fuels to store for emergencies and to understand the best way to store them safely. Which fuels should you store for emergencies and exactly how much fuel should you store? The fuel you chose to store will vary depending on where you live, the intended use for the fuel, and how long your fuel supply needs to last. Take time to review the fuels listed below to determine which will best meet your needs and take care of your family in an emergency. We are frequently asked if it is really possible to safely store enough fuel to last through an extended crisis. That is a great question that Jonathan, an engineer by trade, once embarked on a quest to find the answer. He discovered that storing an entire year supply of fuel is absolutely doable as long as a few key strategies were implemented. Apply conservation techniques in fuel usage – When you use less, you can store less and still get the job done. 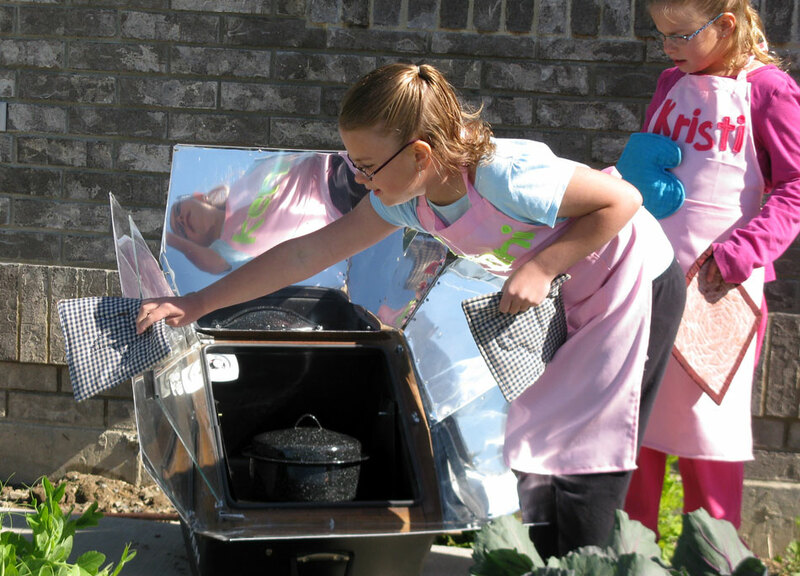 Plan ahead – Cook your main meal in a sun oven during the day to take advantage of free energy or cook your meal at the same time you need to warm the house. Know your fuels and use the right fuel for the job – Don’t start a roaring fire in a wood burning stove if you just need to boil some water. Understand the unique characteristics of the fuels you store – Be sure to store fuel appropriately to maintain optimal performance and safety. Diversify your fuel storage – Make sure you store fuels that are safe to use indoors as well as fuels for outdoor use. In this post, we will review the pros and cons of popular fuels, important safety considerations and how to store each fuel safely. Fuel is one of the four basic necessities for survival. It is an important consideration in our quest to prepare. We need to be able to heat our homes, cook our food and power vital equipment. Fuels can be extremely dangerous. We cannot stress enough the importance of using wisdom in your use and storage of fuels. Be wise–Don’t do stupid things! Place the safety of your loved ones before any other objective. As part of our research, we reviewed the Material Safety Data Sheet (MSDS) on each fuel. These sheets are available online and explain how each fuel should be handled, stored, and what toxins each produce as a result of burning (hazardous combustion products). It is important to note that the amount of chemicals released will vary depending on the temperature and amount of oxygen present. Always provide adequate ventilation when burning anything! Install working smoke and carbon monoxide detectors. Keep fire extinguishers handy. Carbon monoxide poisoning is a real concern. According to the Center for Disease Control, carbon monoxide poisoning is responsible for thousands of emergency room visits and hundreds of deaths annually. Most incidences occur in the winter months. Alternative heating and power sources during power outages, such as portable generators, charcoal briquettes, propane stoves, and grills are listed among the likely causes. Carbon monoxide poisoning is often misdiagnosed because it exhibits flu-like symptoms in the early stages. Please do not risk exposing your family to this dangerous toxin. Be wise! Store in a detached building, preferably not in the garage. Never store a flammable or combustible fuel in any building that you can’t afford to have burned down. 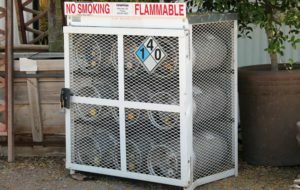 Fuel storage cabinets help contain fumes and protect fuel from ignition sources making them an ideal location to store fuel. In some locations, the law requires 25 gallons or more to be stored inside of fuel storage cabinets. A variety of good fuel storage cabinets can be found online. If you are unsure about the legal guidelines in your area contact your local fire department. The traits which make flammable and combustible fuels useful also make them dangerous. Extreme caution should be exercised in both storage and handling of these types of fuel. Non-combustible fuels, such as coal, wood or charcoal are much safer to store and may be a better option when large volumes of fuel are desired. Read and diligently follow manufacturer guidelines for both devices and fuel. Attend to spills or leaks immediately. Install working carbon monoxide and smoke detectors. Use great caution with any open flame. Never burn anything which produces carbon monoxide indoors. Always provide adequate ventilation when burning any fuel. Store fuel in accordance with local guidelines and ordinances. Liquid fuels are combustible or energy-producing molecules from which we can harness the energy to power a variety of equipment. The fumes are flammable, not usually the actual liquid. Ease of use and transportation makes these fuels quite valuable for home use while the highly flammable nature makes them especially dangerous. Alcohol is a good storage fuel with a very long shelf life. It will lose potency quickly if left open as the alcohol will evaporate. While alcohol burns only half as hot as some other fuels, it works well for cooking and heating. Check out Best Alcohol Cooking Fuels for Campers and Preppers to see how the different forms of alcohol compare to each other. 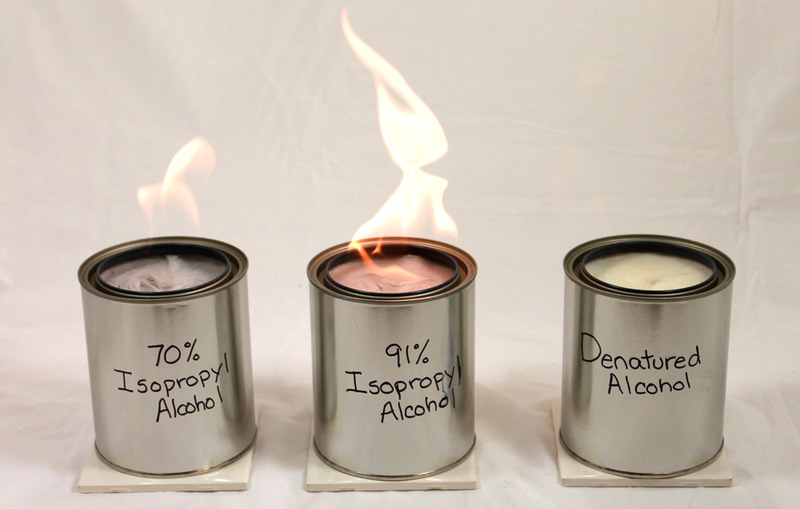 Pure forms of alcohol burn clean enough for indoor use, but alcohol can still produce small amounts of carbon monoxide and carbon dioxide when burned. Always provide ventilation when burning any flame. Use caution when storing as alcohol has a low flash point (ignition temperature) which means it is highly flammable and catches on fire easily. Store alcohol away from chemicals. Denatured alcohol is an excellent alcohol fuel and is available in hardware stores in the paint section. Most manufacturers of alcohol devices recommend denatured alcohol for fuel. Store it in a tightly sealed container. Shelf life depends on the container and can range from two years to indefinite. Ethanol or ethyl (Everclear) is a grain alcohol that can be purchased at a liquor store and is about 95 percent alcohol. Container sizes vary from state to state. It produces a nearly invisible blue or clear flame so be careful not to burn yourself. Methanol (wood alcohol) burns well, but is toxic and easily absorbed through the skin and mucous membranes. Long term exposure can be quite dangerous. We recommend using a safer alcohol for fuel storage. Rubbing alcohol (isopropyl) is another good alcohol fuel. It may be purchased in different strengths. The higher the percentage of alcohol, the better it will burn. There are three varieties of rubbing alcohol readily available, 70 percent, 91 percent strength, and 99 percent. Isopropyl alcohol produces a yellow sooty flame and doesn’t burn as cleanly as some other forms of alcohol. Canned heat comes in a small metal can filled with alcohol or a flammable gel that does not burn quickly. They are made to be used as a chafing dish fuel or in a portable Sterno camping stove. 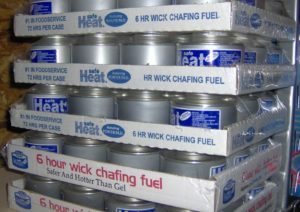 Canned heat is available under a variety of brand names (Sterno, Safe Heat, chafing fuel, etc.) and will burn for 2-6 hours depending on the variety purchased. It creates a visible flame which goes straight up with little spread. Canned heat may be purchased in cases of 12 cans that stack and store nicely. The shelf life of unopened cans is approximately ten years if stored in a cool, dry place. 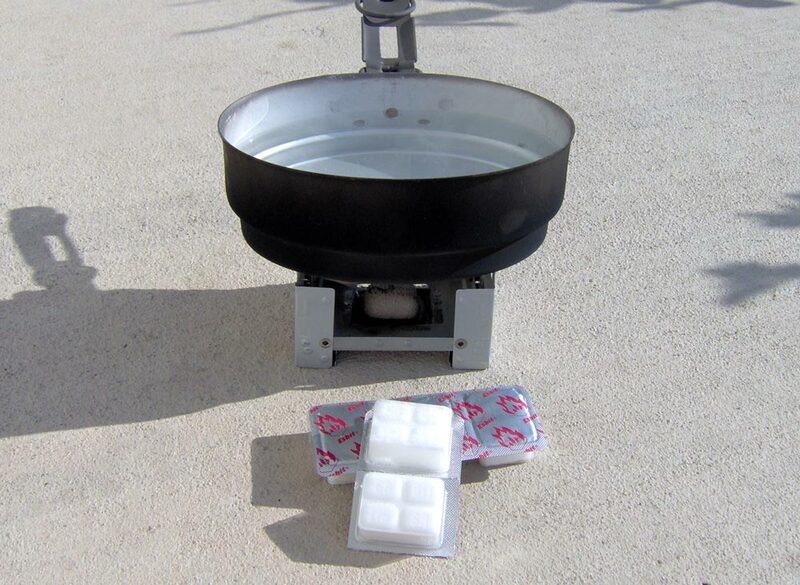 This clear fuel is a camping favorite and will burn hot even at subzero temperatures. The liquid and vapor are highly flammable. Do not use Coleman fuel indoors as it produces vast amounts of carbon monoxide and other asphyxiates during combustion. The fuel should be stored in the original container in a cool, well-ventilated area away from ignition sources, heat, pilot lights, static electricity, and open flame. An unopened container, with no rapid temperature changes, has a shelf life of 5-7 years. An opened container will remain viable for up to 2 years. Diesel fuel is easily obtained and can be used to power a generator. Conventional diesel has properties similar to gasoline but is less flammable. It may gel in cold temperatures which will inhibit the ability to pump it with a regular fuel pump. Special low-temperature diesel contains additives which may help, but not prevent, this problem. Diesel produces carbon monoxide, carbon dioxide and non-combusted hydrocarbons (smoke). Never use indoors, or near doors or windows, which may allow leaks to enter the home and create a carbon monoxide poisoning risk. Diesel should be stored in approved yellow fuel cans in a cool, well-ventilated place or in above ground tanks. The smaller containers can be purchased at sporting goods stores or retailers. Diesel has an 18-24 month shelf life which can be extended almost indefinitely by annually adding a quality fuel stabilizer, such as PRI-D. This popular fuel can be found in most households in a variety of common equipment, including automobiles. Gasoline does not actually burn. The flames ignite, causing the liquid to evaporate and burn. It combusts easily and is highly volatile. The utmost care should be exercised in both use and storage, as any leakage has the potential of being extremely dangerous. The safest place to store gasoline is in the tank of your car. Keep your tank half full and you always have a fresh gasoline to power a generator or enough to evacuate an area. Gasoline has a short shelf life. Within a year the fuel will begin to degrade and can damage equipment. A good quality fuel stabilizer, such as PRI-G, can be added annually to extend the shelf life indefinitely. Gasoline should only be stored in approved red containers in quantities as recommended by local ordinances. In our area, gasoline storage is limited to 10 gallons in an attached garage. Citizens may store up to 25 gallons total in an unattached garage or shed. Storing large quantities is hazardous. Kerosene (also known as kerosene, paraffin, kero) is an oily fuel used for heating and cooking. It is available in different grades. Klean Heat is an example of a premium grade of kerosene which burns cleaner than standard. Standard kerosene is available in two grades; K-1 and K-2, the main difference being the level of sulfur. K-1 has a sulfur level below 0.05 percent which makes it an acceptable fuel for unvented kerosene heaters and cooking devices. We personally never burn kerosene indoors. Care should be taken as kerosene vapors have the ability to travel long distances into other rooms. Keep away from ignition sources such as open flame, pilot lights, electrical outlets and switches, and static electricity. The manufacturer of Klean Heat recommends refueling out of doors in an open air area. If refueling must occur indoors, open all windows and doors to maintain a cross ventilation of moving fresh air. Klean Heat still produces dangerous byproducts of combustion such as carbon monoxide. Kerosene produces carbon monoxide, carbon dioxide, nitrogen dioxide, and sulfur dioxide when burned. Use great caution if burning indoors to maintain adequate cross ventilation. Kerosene has a shelf life of 2-5 years and should be stored in original packaging or in approved blue containers. A high-quality fuel stabilizer, such as PRI-D, added annually can extend the life of kerosene indefinitely. Lamp oil is a liquid petroleum product in the same family as kerosene designed to burn cleanly in lanterns, torches, and brass or glass lamps. It is more refined so it will not produce harmful smoke, soot, and other pollutants. Lamp oil must be kept at or near room temperature. Frozen lamp oil may defrost too quickly, posing an explosive risk. It comes in a wide variety of colors and scents. Charcoal lighter fluid is a highly volatile fluid which can be made from either a petroleum or alcohol base. Great care should be used in the storage and use of the product. It can impart an unpleasant flavor to foods cooked with it. Keep container closed. Store away from open flames, sparks, heat sources, direct sunlight, strong oxidants, and corrosives. A good replacement for charcoal lighter fluid is a charcoal chimney. Newspapers or canned heat can be used to ignite charcoals in a safer manner using the chimney. Liquid paraffin is a distilled form of kerosene and is similar to other lamp fuels such as coal oil, lamp oil or kerosene. It is available in a variety of colors and scents. It should not be confused with paraffin wax. Liquid paraffin is highly toxic if ingested while paraffin wax is chemically benign, which is why it can be used in making homemade jams and jellies. Medicinal liquid paraffin is a highly refined white mineral oil used in cosmetics and for medicinal purposes. According to the material safety data sheet, liquid paraffin produces carbon monoxide and carbon dioxide when burned. Good general ventilation should be sufficient to control airborne levels. Should be stored in a cool, dry well-ventilated area. Fuel deteriorates in storage and becomes gummy, which will plug fuel filters, foul injection systems, and prevent equipment from operating. An emergency is not a good time for your equipment to fail. Gasoline, diesel, and kerosene can be stored for many years if treated with a high-quality fuel stabilizer annually. For instance, one bottle of PRI treats 256 gallons of fuel. PRI has an indefinite shelf life if unopened. Once opened the manufacturer recommends a 3-year shelf life. After that time it will begin to lose its effectiveness. Gaseous fuels, under normal conditions, remain in a gaseous form which allows them to be easily transported through pipes from point of origin to place of consumption. Some may be liquefied for transit or storage. It is possible for these gases to escape and collect undetected posing an explosive risk. Odorizers are commonly added to assist in detecting leakage. Butane is highly flammable, colorless and easily liquefied. For our purposes, butane is used in lighters, butane torches and bottled as a fuel for cooking or heating. When burned, it produces carbon monoxide and carbon dioxide. Adequate ventilation must be provided. Butane does not perform well at near freezing temperatures. Butane cylinders must be carefully stored above freezing (32° F) and below 120°F away from open flame or heat sources. They are extremely flammable and exposure to heat or fire could result in detonation. Do not store near any oxidizing materials (chlorine or concentrated oxygen) in a cool, dry location with adequate ventilation. It is possible to have access to natural gas during a power outage. Some appliances, such as a furnace, require electricity to operate in addition to natural gas. A number of natural gas ranges, fireplaces and water heaters may work when the power is out depending on the model. Most gas ranges will still work by lighting manually but do not count on the gas oven working. We recommend that you turn off your electricity and experiment. Which of your gas appliances might provide some of your fuel needs during an outage if you still have access to natural gas? We do not count natural gas in our list of storage fuels because the supply may be disrupted. It is a great option if it is available. Natural gas is a colorless gas with an offensive odor added to assist in the detection of leaks. Carbon monoxide poisoning can occur if appliances are not functioning properly or due to poor ventilation. Natural gas is extremely flammable and may be ignited by a simple electrostatic discharge (static electricity). When breathed in, vapors may displace oxygen resulting in drowsiness, lightheadedness or dizziness, impaired judgment, unconsciousness or death. If you smell the typical rotten egg odor, leave the home immediately and call your local gas company. Gas should be turned off at the meter where the gas supply enters the home if you hear or smell leaking gas in an emergency. The gas should only be turned back on by the gas company. 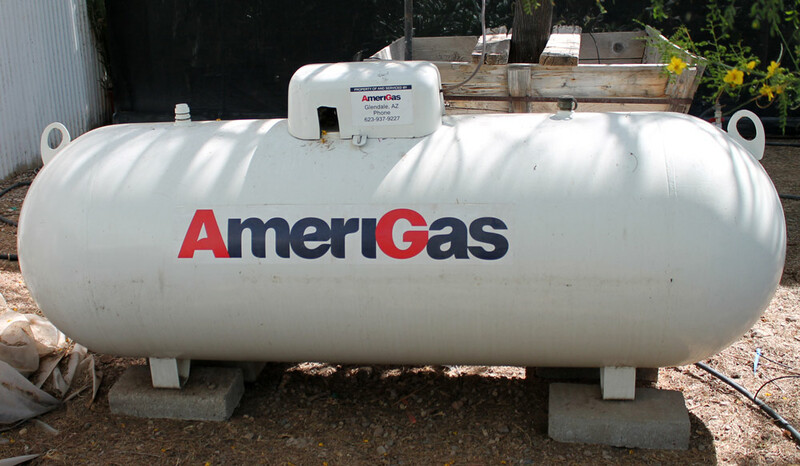 Propane is a liquid fuel stored under pressure which is vaporized into a gas before leaving the tank. It is available in portable 1 pound disposable tanks, 5 pound tanks, 20 pound tanks, 30 pound tanks as well as fixed tanks that hold hundreds of pounds of propane. It creates a nice hot, clean fire. The equipment and tanks are simple to use. The fuel will store indefinitely but check the tanks for signs of rust or dents. 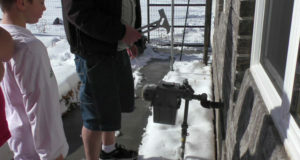 Propane should be stored with service valves closed and plugged when not in use. Propane is heavier than air and may collect in low-lying areas creating an explosive risk. When propane burns it produces carbon dioxide, nitrogen, and water vapor. However; incomplete combustion may occur if there is not enough oxygen, which can result in the production of carbon monoxide. Always provide adequate ventilation when using. 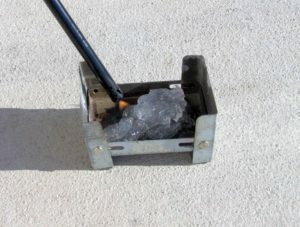 Freeze “burns” may result from touching liquid propane. It is highly flammable when mixed with oxygen and can be ignited by open flames, smoking materials, electrical sparks, and static electricity. Solid fuels are solid materials that release energy through combustion to provide heat. These fuels tend to be safer to store and have a longer shelf life than liquid or gaseous fuels. Charcoal burns hotter and cleaner than wood. The briquettes store safely, but must NEVER be burned indoors! Charcoal consumes a tremendous amount of oxygen and produces a vast amount of carbon monoxide, a deadly poison. 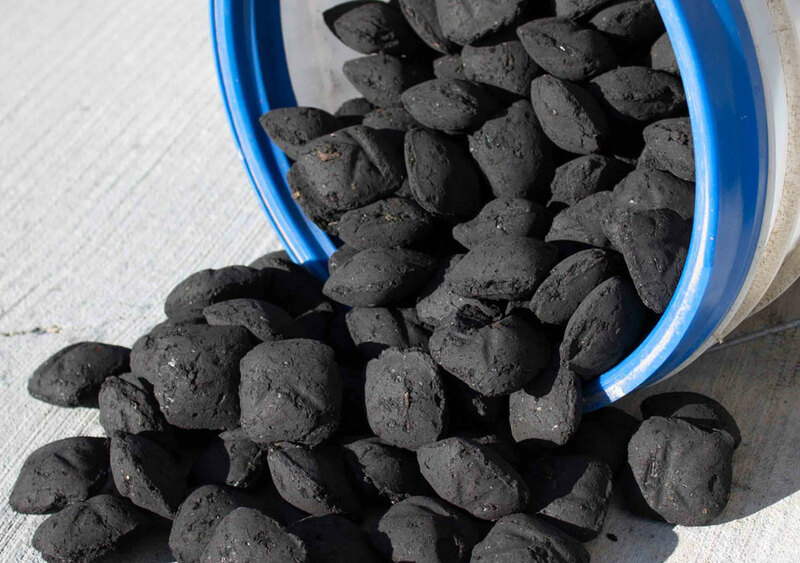 Purchase high-quality charcoal for fuel storage. Do not store ready-to-light varieties. The lighter fluid will evaporate over time and will not be of any benefit. Charcoal will store for an extended period of time if it is stored in airtight containers, such as a sealed 5-gallon bucket. Moisture absorbing desiccant may also be helpful in keeping it dry. When stored in the original paper bag it can absorb moisture, rendering it minimally effective or useless over time. Recharge it by laying it out in the sun on a hot day. 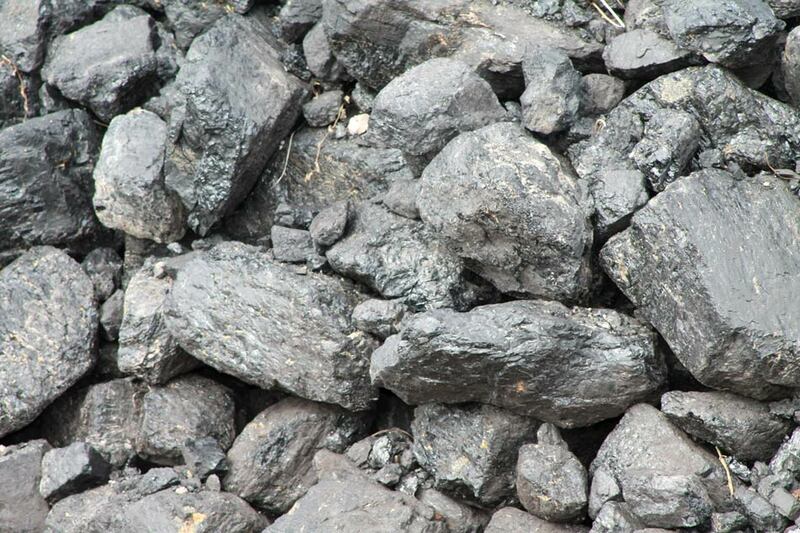 Coal is a naturally occurring sedimentary rock that makes a great fuel. It burns hotter and longer than wood. Coal produces carbon monoxide when burned and should only be burned in a carefully maintained coal fireplace. It requires significant oxygen to burn efficiently or the carbon monoxide may escape into the home instead of up the chimney. Coal fires should be started slowly beginning with newspapers and wood. 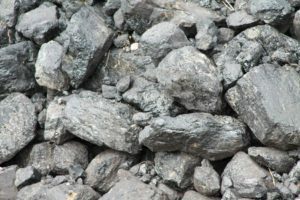 Small pieces of coal are slowly added to the fire to prevent smothering the fire. It can be purchased in bags or in bulk. Debris, for our purposes, refers to any available burnable material. In the aftermath of a disaster, there may be debris which can be used as fuel such as wood from destroyed buildings or landscape. Use caution not to burn debris which has paint, varnish or stain as it may release harmful toxins into the air. These are small cubes that generate up to 1400 degrees of intense heat for 12-15 minutes. It can be used as a fire starter, for cooking, or as a heat source. Esbit tablets produce very little smoke and leave almost no residue. They produce several toxic gases (formaldehyde, ammonia, nitro gases, and hydrogen cyanide) when burned, so make sure to use outside in a well-ventilated area. Most fuel tablets have an indefinite shelf life and are non-explosive. Store in unopened, original packaging and keep away from moisture and sources of ignition. Firewood is a great fuel. 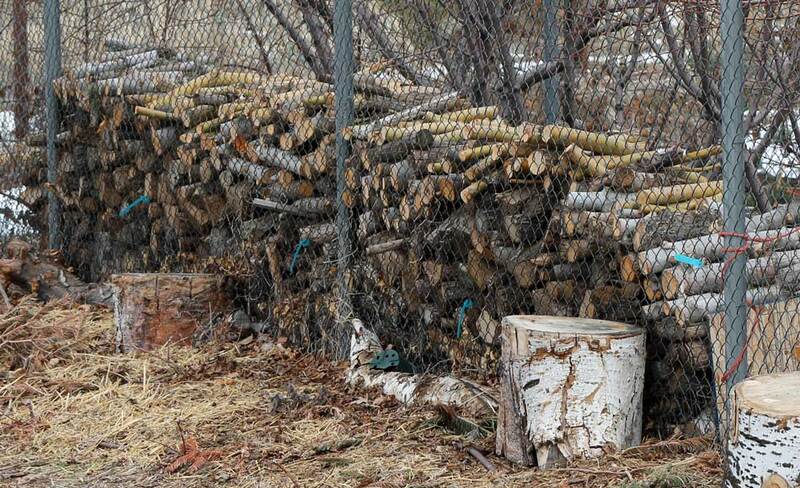 Wood is one of the least expensive ways to heat your home and one of the safest storage fuels. All wood is not equal. Some varieties pop and smoke, some burn hotter or longer, and some just smell nicer when they burn. As a general rule, hardwoods (deciduous trees such as; oak, hickory, maple) produce more BTUs (heat content) than softer woods (conifers such as; pine, fir, cedar). The best fires are a mixture of softwoods and hardwoods. The softwood starts easily while the hardwood burns longer and produces nice coals. It is best to store wood off of the ground on cement blocks, pallets or wooden planks. This reduces insect infestation, wicking moisture from the ground and improves air circulation. 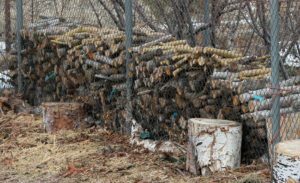 Firewood will store indefinitely; however, after four years the energy output will begin to decrease. Seasoned wood works best. Freshly cut trees may be 50-60 percent water. The moisture greatly reduces the available energy. Once the wood is allowed to dry for six months or so it will produce about twice the BTUs as freshly cut. Burning wood causes creosote to form in stovepipes and exhaust systems. Creosote fires can be extremely dangerous and can lead to major house fires. Take precautions to reduce your risk of creosote fires. Inspect your stovepipe and stove exhaust system regularly. Burning wood produces carbon monoxide. It is important to use a well-maintained fireplace or stove which has been specifically designed to burn wood. PyroPac is an example of a gel fuel which is a great portable heat source. Squeeze the gel onto a fire-safe surface and light. It can be used in a small fuel tablet stove. A single 1.25-ounce packet will burn for 15 minutes leaving only tiny white ash behind. Use great care to use in a well-ventilated area and do not breathe fumes. Meals Ready to Eat heaters are designed by the military to heat MRE meals quickly and safely without fire. They can also be used to provide localized warmth. They are made from powdered food grade iron, magnesium, and sodium. When water is added to the chemicals in the heater, a chemical reaction heats up almost instantly. MRE heaters have a shelf life of about five years. Older heaters take longer to heat up. The vapors released by an activated heater contain hydrogen, a flammable gas. Do not place near an open flame. MRE heaters are safe to use indoors. Newspapers are handy to have around. They are great to start fires or charcoal with. 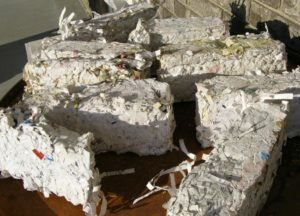 Paper bricks can be made out of soaked shredded newspaper. A brickmaker forms the soaked paper into a brick shape and squeezes the water. The bricks are dried for a few weeks and will burn at a rate of four per hour. This method is quite time intensive. Newspaper logs can be created by rolling dry papers around a dowel, tying them with twine and then soaking for several hours before drying. Another method is to soak the newspapers first and then roll them onto a dowel and tie. The dowel is always removed before drying. It allows air to circulate through the center speeding the drying process and reducing the risk of mold. Adding a little bit of dish detergent to the water during the soaking process seems to make a better product. Burn a combination of paper logs and firewood for a better fire. Paraffin is a white or colorless soft, solid derived from petroleum coal or oil shale. It contains a mixture of hydrocarbon molecules and is distinct from kerosene. Wax candles are a good old standby to provide light and a little warmth. Paraffin and beeswax both can produce a small amount of carbon monoxide, carbon dioxide and small amounts of sulfur and nitrogen when burned. Always burn in a well-ventilated area. 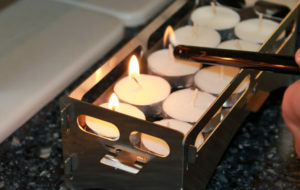 Candles will keep in a cool, dry, well-ventilated location, away from heat or sources of ignition. Wax candles will store indefinitely. Store in a tightly-covered container. A compressed, solid fuel used for fire starting, cooking and as a heat source. One bar will burn for 7-9 minutes creating intense heat. Trioxane fuel bars are designed for military and survival use. They come packaged in a coated, waterproof, foil wrapper with each bar scored in thirds. They are a military surplus item and produce very little flame and no smoke. Trioxane should only be used outdoors as it produces toxic gases when burned. These fuel bars store indefinitely in a cool, dry place. This fuel is made out of compressed sawdust. Wood pellets are a good solid fuel which burns quite efficiently in a wood pellet stove. Pellet stoves require electricity to operate a hopper which feeds the pellets into the stove. To be an effective emergency preparedness tool, a back-up power system would be necessary. Store a generous amount of pellets as they are difficult to find at times. They come in manageable 40-pound bags and store nicely. Wood pellets have an indefinite shelf life if stored in a dry place out of direct sunlight. Household batteries come in two basic categories; single-use and rechargeable. The chemistry composition is different so do not try to recharge single-use batteries. Batteries should be stored separate from devices (flashlights, radios, etc.) in a cool dry place, at normal room temperature. Heat can lead to leakage, rupture and capacity loss. 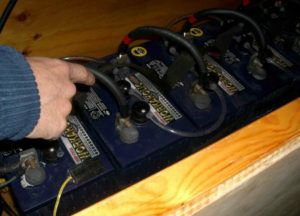 Batteries can have a shelf life of 10-15 years depending on storage, quality and type of battery. Single-use or disposable batteries include alkaline, carbon-zink, lithium, silver-zinc and zinc air. Rechargeable batteries can be recharged and used repeatedly. Solar battery chargers are a great option for recharging batteries without electricity. To extend the battery life of rechargeable batteries, do not store them unused for an extended period of time. Charge every 6-9 months. Nickel Metal Hydride (NiMH), Lithium Ion (Lilon), Nickel Cadmium (NiCd) and Sealed Lead Acid (SLA) are examples of rechargeable batteries. A battery bank is a collection of two or more batteries joined together to function as one. The purpose of a battery bank is to provide more power than a single battery. It can be a handy tool to provide power during an emergency. A small battery bank, kept charged by using household power, may be enough to run critical medical equipment during a short term power outage. 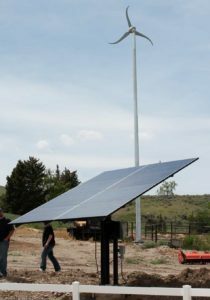 Battery banks can be charged with standard household power, solar power, wind power or with a generator. An inverter is used to convert the power to usable household power. Battery storage life varies greatly depending on the type of batteries used. 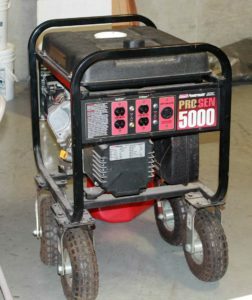 A generator may be a useful tool to provide back-up power. A couple of hours a day would be enough to maintain a freezer or refrigerator and allow a few hours of convenience. Connect appliances directly to the generator using approved and properly sized power cords. Always operate your generator outside, away from windows or doors where exhaust containing carbon monoxide may enter the home. Read and follow manufacturer recommendations when operating a generator. Never refuel while running. Watch your generator closely during use. They are noisy and advertise the fact that you have power and are a prime target for thieves. Radiant light and heat from the sun is referred to as solar energy. It is an abundant source of free energy which can be a great tool in everyday life as well as during emergencies. We usually refer to solar energy as active or passive depending on the way it is captured, converted and distributed. Active solar uses photovoltaic panels or thermal collectors to harness the energy and produce electricity. A sun oven with reflectors, solar powered battery chargers, and photovoltaic panels mounted on a roof are all examples of active solar. Passive solar is incorporated in the design of buildings to warm them, take advantage of natural lighting and improve air circulation. Small changes in the orientation and design of buildings can translate into significant savings. Our chicken coop is an example of a passive solar design. It faces south sporting a reclaimed industrial glass door and window. The winter sun shines through the glass and warms the four foot cinder block wall inside the coop which provides thermal mass. The wall radiates the warmth back into the coop during the night when temperatures are lowest. During the hot summer months, the overhang prevents the direct sun from shining into the chicken coop so it remains cool. Air vents on both sides at the top of the coop ensure adequate air circulation and ventilation. Another amazing use for solar energy is for water disinfection. It is possible to kill the nasty pathogens in water by clarifying (removing debris from it), placing it in a two liter clear plastic bottle, and placing it out in the sun for a day. See UV Rays Save the Day—Disinfecting Water with the Sun. The power of the wind may be harvested using wind turbines to generate electricity. The power can be used immediately or stored in a battery bank to be used when the wind is not blowing. Small turbines are available for home use. A small hybrid system can take advantage of both solar and wind. Go to Wind Powering America for wind resource maps and information on using wind power. We strongly encourage you to have working fire extinguishers, smoke detectors and carbon monoxide detectors located in strategic places in your home. 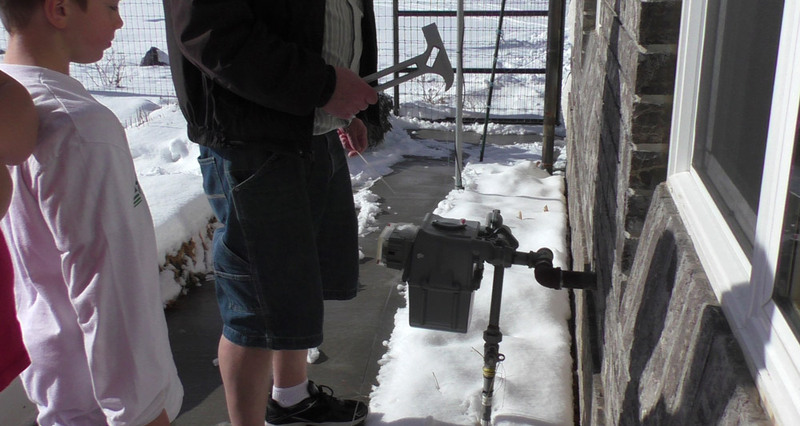 Know how to turn off the natural gas supply to your home. Teach each member of your household how to use and practice with a fire extinguisher. Learn the dangers of carbon monoxide and warning signs. Conduct regular fire and carbon monoxide drills so everyone knows what the alarms mean and exactly what to do. Do not just talk about it. Physically do it! Contact your local fire department and learn what the fuel storage guidelines and restrictions are for your local area. Apartment dwellers may have different guidelines than single family homes. Safely and legally build your plan around these guidelines. Contact your insurance agent to discuss our homeowner’s policy. Ask for specific information regarding fuel storage. Depending on your policy, storing some types or amounts of fuel may negate your policy. It may be wise to review your written policy also. Follow the guidelines from your insurance policy. Make a list of the critical items you might need fuel for during an emergency. Explore the different fuel options you have available. This list should include only those things which are necessary for survival. Needs and wants are two very different things. Focus on providing for needs before luxury or convenience items. Carefully consider where the fuel should be stored. A few fuels may be safely stored inside a garage, but most should be stored in a detached shed. It would be better to do without than to accidentally start a dangerous house fire. The length of time you want to prepare for is an important consideration. 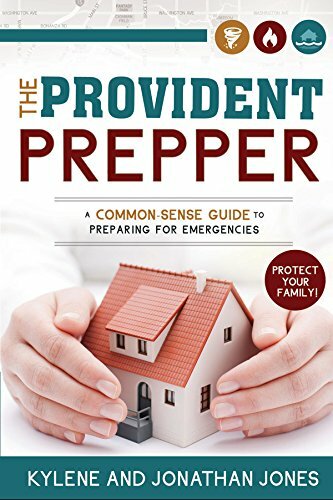 Your goal may be to function through a short term power outage, make it through the winter, or survive an entire year in the event of a long term power outage caused by an EMP. Implementing conservation strategies will enable you to consume considerably less fuel. Do not stress over exact numbers. Make educated guesses. As you practice, you will get a better idea of exact fuel consumption and will be able to tweak your plan appropriately. Check out our free worksheet to walk you through designing your fuel storage action plan. As you plan and prepare, be sure to make safety your number one priority.